Johannes Brahms was born on 7th May 1833 in the Gängeviertel district of Hamburg, the son of a double-bass player and his wife, a seamstress seventeen years her husband's senior. It was intended that the boy should follow the father's trade and to this end he was taught the violin and cello, but his interest in the piano prevailed, enabling him to supplement the family income by playing the dockside taverns, while taking valuable lessons from Eduard Marxen. In 1853 Brahms embarked on a concert tour with the Hunagrian violonist Eduard Reményi, during the course of which he visited Liszt in Weimar, to no effect, and struck up a friendship with the violinist Joseph Joachim, through whose agency he met the Schumanns, established now in Düsseldorf. The connection was an important one. Schumann was impressed enough by the composition that Brahms played to him to hail him as the long-awaited successor to Beethoven. Schumann's subsequent break-down in February 1854 and ensuing insanity brought Brahms back to Düsseldorf to help Clara Schumann and her young family. The relationship with Clara Schumann, one of the most distinguished pianists of the time, lasted until her death in 1896. It was not until 1862, after a happy period that had brought him a temporary position at the court of Detmold as a conductor and piano teacher, that Brahms visited Vienna, giving concerts there and meeting the important critic Eduard Hanslick, who was to prove a doughty champion, pitting Brahms against Wagner and Liszt as a composer of abstract music, as opposed to the music-drama of Wagner and the symphonic poems of Liszt, with their extra-musical associations. Brahms finally took up permanent residence in Vienna in 1869, greeted by many as the real successor to Beethoven, particularly after the first of his four symphonies, and winning a similar position in popular esteem and similar tolerance for his notorious lack of tact. He dies in 1897. There seems little doubt that the death of his mother in January 1865 was the immediate reason for the composition of A German Requiem, a large scale work that developed gradually over the years immediately following, but may well have been under consideration for some years. The second movement, at least, makes use of material from the slow Scherzo of the composer's rejected symphony of 1854 and 1855, the period of Schumann's final illness. Three of six completed movements were performed in Vienna in 1867 by the Gesellschaft der Musikfreunde under the direction of Johann Herbeck, but was badly received. Brahms, as a North German Protestant, had chosen to make use of texts from the Lutheran Bible, drawing on the Old and New Testaments and on the Apocrypha, and such a work might well have been seemed strange to Catholic Vienna, even had it been properly rehearsed for the occasion. Albert Dietrich, a young composer and conductor and a pupil of Schumann, whom Brahms had first met in Düsseldorf in 1853, sent a copy of the work to the organist and director of music of Bremen Cathedral, Karl Martin Reinthaler, who arranged the first performance of all six movements on Good Friday 1868, under the direction of the composer. 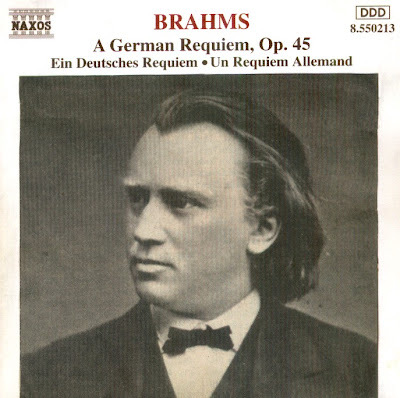 On this occasion the Requiem was very successful and with the addition of a seventh movement, placed fifth in the whole work, became in the following years a valuable and esteemed element in choral repertoire both in Germany and abroad, establishing the wider reputation of Brahms. The texts chosen avoid overt Christian reference, and the composer himself suggested in private correspondence that he would have liked to substitute the word "human" for "German" in the title. It has its roots above all in Bach and it has been suggested that Brahms may have drawn some inspiration from the much earlier work of Schütz. It is clearly vastly different in character from the liturgical Latin Requiem of Catholic tradition with its evocation of the Day Of Judgement and its prayers for mercy on the souls of the dead. The CD was released by Naxos, 1993, (DDD). Naxos 8.550213.